You'll discover distinctive historic architecture, world class museums, pristine diving sites, uncrowded sandy beaches, secluded coves, a lot of ethnic diversity, exciting international cuisine, and no fear of hurricanes ruining your vacation. The capital city Willemstad looks quite like the Dutch architecture overlooking the canals in Amsterdam. The pastel colored 17th and 18th century Dutch colonial buildings have this capital city one of the most beautiful in the Caribbean region, and also designated a UNESCO World Heritage site. Willemstad's buildings, unique small cafes and outdoor markets are divided into two sections, Otrobanda and Punda. Both sections of the cities are connected by the Queen Emma Bridge - fondly called the "Swinging Old Lady" bridge. 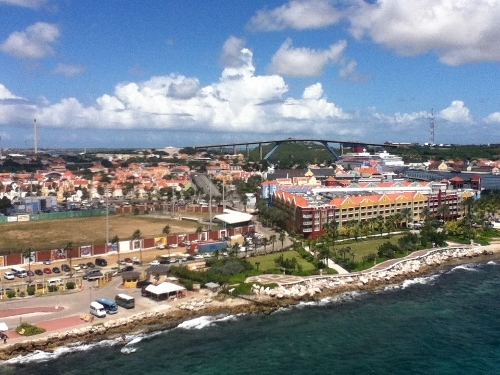 The European flair is not the only things that separates Curacao from other Caribbean islands. It is not dependent on tourism and has oil refineries along with a deep-water harbor which both contributes to the economy. Curacao is located approximately 44 miles south of the Venezuelan coast and is part of an island group known as the ABC Islands. Aruba, Bonaire, and Curacao are outside the hurricane belt. This makes all three destinations a great value destination during the annual Caribbean hurricane season which runs from June to November. The island gets very little annual rain, and the average temperature year-round is a pleasant 80 degrees. More than half of the tourist are from Holland, and approximately 25% are from the U.S.
Curacao is a very cosmopolitan island with over 65 ethnic groups including African, Dutch, Portuguese, Chinese, Lebanese, British West Indians, Surinamese, Hindu, Jewish, Muslim, Catholic, Protestant, along with other groups. With this many ethnic groups, you can imagine the island cuisine is just as diverse. Some of the local specialties are KeshiYena - (stuffed cheese with chicken and prunes), Funchui (Corn Meal Mush), and Tutu (Corn Meal With Black Eyed Peas). Scuba Diver magazine rates Curacao as the healthiest marine environment in the entire Atlantic Ocean and the Caribbean Sea – and one of the top three in marine life with more than 60 spectacular dive locations. 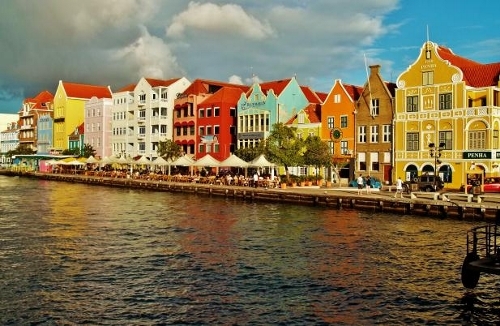 Curacao is also home to one of the more interesting properties in the Caribbean. The Sandton Kura Hulanda Resorts is a member of the Small Luxury Hotels of the World, and comprised of two island properties - the Sandton Kura Hulanda Hotel & Spa and Sandton Kura Hulanda Lodge & Beach Club. The property in Willemstad is home to the world-class Kura Hulanda Museum which focuses on Curacao's culture and offers a chronicle of the Origin of Man, the African slave trade, West African Empires, Mesopotamian relics and Antillean art. comprised of 15 buildings, and 16,000 square feet.